Howdy! Today I went for something sparkly, with rhinestones and tape :) The balls will come later in this post! 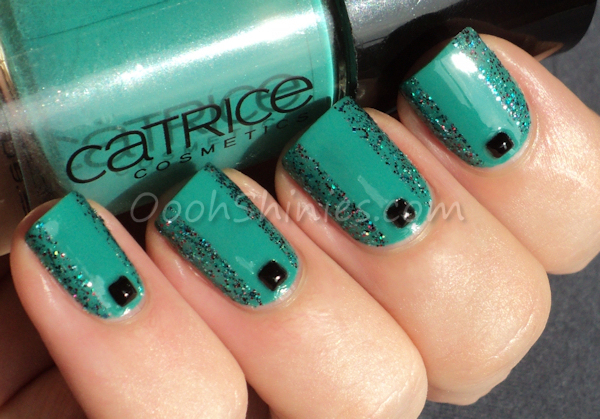 Catrice Emerald Bay with Shimmer Cristina. I then used this tape from BornPrettyStore and applied a strip in the middle, and added Shimmer Polish Cristina on the sides. Rhinestones, top coat, done! The tape comes in 2 sizes, 0.5cm (that I'm showing here, price $1.99) and 1.2cm, both 17m long. It's pretty much your average masking tape, but then in a smaller version, which I figured could be handy for nail art! I went with a simple strip of this tape for this mani, but it should also help to get a thinner strip, I think cutting this straight in half will be easier than cutting a small strip of a bigger tape. 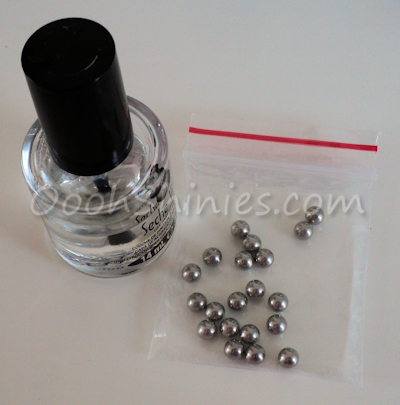 The balls that I mentionned earlier are these stainless steel balls (20 for $1.99, and with coupon code ABJ61 you'll get 10% off), perfect for mixing your own polish, fixing a polish that separated a bit and doesn't have balls yet to help it go smoother, or if you add a little nail polish thinner, you could use them to bring an old polish back to life! I'm showing them here next to my standard top coat, to give you an idea of their size, they're fairly big - but not too big to fit in the bottles. Thanks for stopping by and have a lovely evening!